Dive Journal: With Johnny newly certified, Linda and I have reasoned that he needs to exercise his diving skills in a comfortable setting. We also reason that, despite a fair amount of diving experience, we actually have very little within the continental U S (except for Arizona (dive #6) and California (dive #35, #36, and #37). Therefore, the Florida Keys seem perfectly suited for our next dive trip. Linda spends several weeks perusing the diving opportunities through the Internet, and she finally selects Islamorada as the destination. We fly American to Ft Lauderdale (through Dallas), then rent an Izusu SUV for the trip south, first down I-95 to Miami, then on down US1 through Homestead, Key Largo, and finally Islamorada. We settle in to our home for the week at Pines and Palms Resort, located at Mile Marker 80 on Upper Matecumbe Key. The place advertises “Caribbean cottages” which turn out to be quite nice although a bit on the small side. Still, Linda and I are comfortable in our one bedroom, while the kids share the living room pullout bed. There is a barely-equipped kitchenette with a refrigerator that we quickly stock with a week’s worth of food and drink from the Winn-Dixie up in Tavernier. Pines and Palms has a very pleasant heated pool right on the waterfront, good party gazebo, and a couple nice piers with chairs at the end. The grounds have lots of coconut palms, the air is humid and salty, and we are immediately loving the tropical ambiance. Linda makes an observation that not leaving America is, somehow, not quite as much of an escape as other trips we’ve taken. At least there is a friendly grounds keeper at the resort named Brett, and he’s from Australia. Our first dive is scheduled for Sunday afternoon, the last day of June. We’ve booked a dive package with the Ocean Quest dive shop, located north of us at Mile Maker 85 on Windley Key. We meet owners John and Pat and right away are presented with a decision – whether to dive or not after the morning rains, with more threatening to follow this afternoon. It is possible the surface may be a bit choppy. It’s a quick decision - sure, why not? We’ve come all this way and we’re ready to dive! Boat captain Sarah takes us out through the Smuggler’s Cove waterway, under the US1 bridge, and out another couple of miles into the Atlantic to a dive site called Rocky Top. The four of us suit up slowly, reorienting with our gear, and enter the water by giant stride. We already know that divemasters are not a part of Florida Keys diving, and so we’re on our own today. The reef is really quite shallow, only around 20 feet deep, and we find out quickly the visibility is not so great today, maybe only 20 feet or so, due probably to the rain runoff and winds stirring things up. Still, it is great to back diving with our Caribbean friends, including grey angelfish, blue-striped and French grunts, goatfish, and scrawled cowfish. I am pleased to spot a new fish, a blue angelfish. These guys are fairly common in Florida waters but are absent in the rest of the Caribbean. 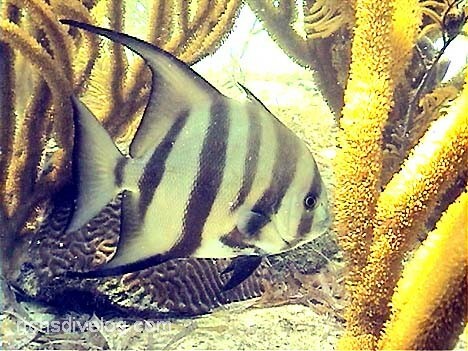 Similarly, we also spot our first Atlantic spadefish and Janel works on getting plenty of video of a group of three. She also frames up a juvenile yellowmouth grouper for identification. Linda spies a gulf flounder – very well camouflaged against the white sand. I am Johnny’s partner on this dive, so I stick close to him while Janel does most of the video work. Unfortunately, I’ve forgotten to reset the camera’s white balance (set manually during the filming of the kid’s Broadway show back in Arizona). The video ends up OK in some spots, but very overexposed in others. Great to be diving again!